Double click the installer to launch. To prevent permission errors, do not launch the installer from the Favorites folder. If you encounter issues during installation, temporarily disable your anti-virus software during install, then re-enable it after the installation concludes. If you installed for all users, uninstall Anaconda and re-install it for your user only and try again. Read the licensing terms and click “I Agree”. Select an install for “Just Me” unless you’re installing for all users (which requires Windows Administrator privileges) and click Next. 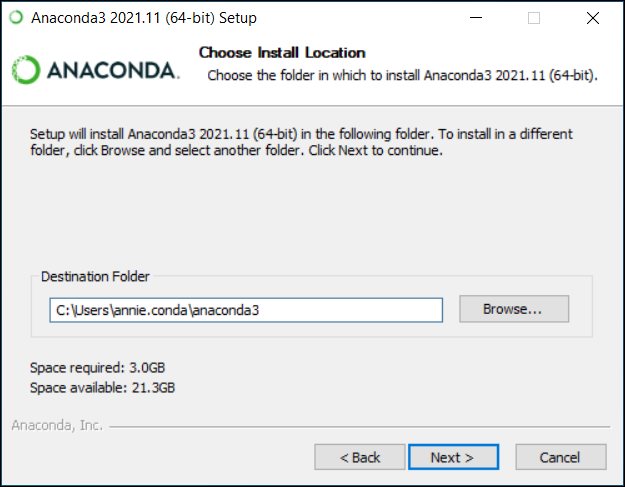 Select a destination folder to install Anaconda and click the Next button. See FAQ. Install Anaconda to a directory path that does not contain spaces or unicode characters. Do not install as Administrator unless admin privileges are required. 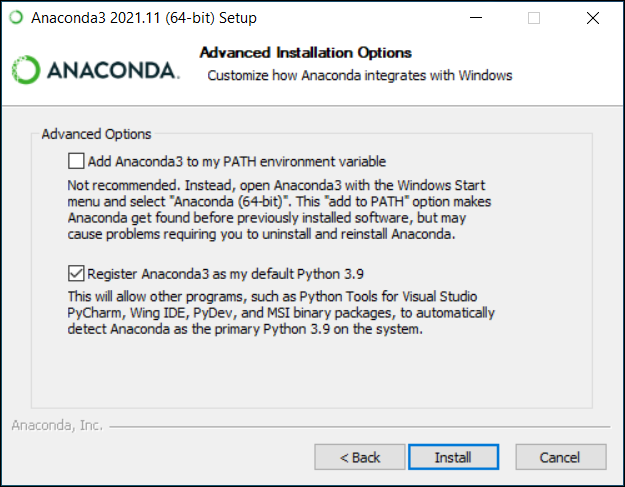 Choose whether to add Anaconda to your PATH environment variable. We recommend not adding Anaconda to the PATH environment variable, since this can interfere with other software. Instead, use Anaconda software by opening Anaconda Navigator or the Anaconda Prompt from the Start Menu. Choose whether to register Anaconda as your default Python. Unless you plan on installing and running multiple versions of Anaconda, or multiple versions of Python, accept the default and leave this box checked. Click the Install button. If you want to watch the packages Anaconda is installing, click Show Details. 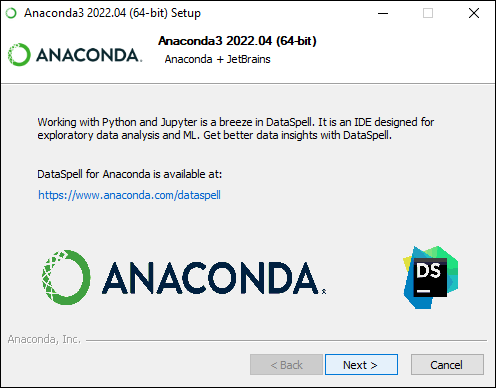 Optional: To install PyCharm for Anaconda, click on the link to https://www.anaconda.com/pycharm. Or to install Anaconda without PyCharm, click the Next button. If you wish to read more about Anaconda Cloud and how to get started with Anaconda, check the boxes “Learn more about Anaconda Cloud” and “Learn how to get started with Anaconda”. Click the Finish button. 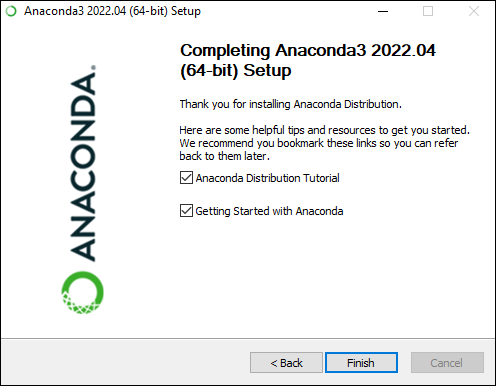 After your install is complete, verify it by opening Anaconda Navigator, a program that is included with Anaconda: from your Windows Start menu, select the shortcut Anaconda Navigator from the Recently added or by typing “Anaconda Navigator”. If Navigator opens, you have successfully installed Anaconda. If not, check that you completed each step above, then see our Help page. Get started programming quickly with Anaconda in the Getting started with Anaconda guide.